Our new friend Ivan came to the US with one goal... to purchase a 1969 Mustang and embark on the great American road trip! Unfortunately, he had some troubles along the way. We met Ivan after the recently rebuilt 351 in his new '69 Mustang started eating valve springs. He was stuck on the side of the road just down the street from the V8 Speed & Resto Shop, so we gave him a hand so he could complete his U.S. circle tour and ship his new ride back to Germany. Like we always say, old cars make new friends! 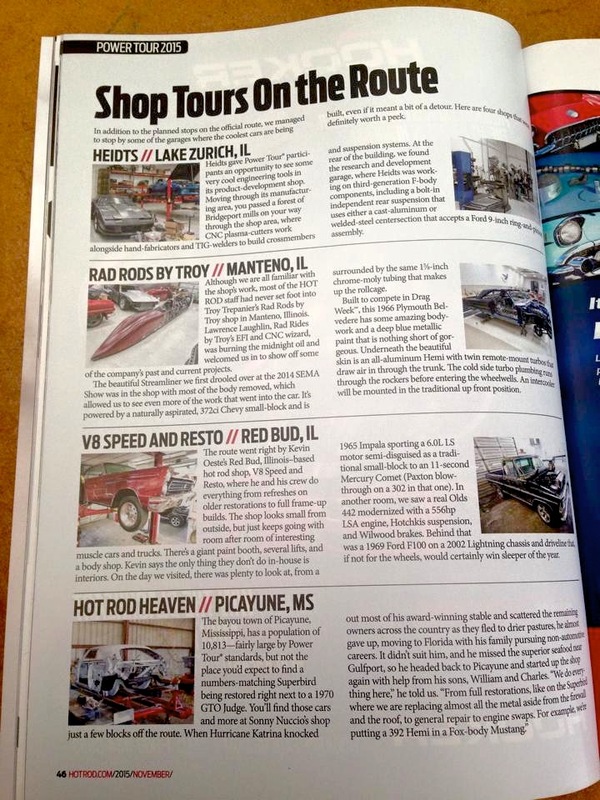 The V8 Speed & Resto Shop Crew wishes to thank Hot Rod Magazine for including our shop in their 2015 Hot Rod Power Tour coverage! The 2015 Tour rolled past our shop on June 9, and we all had a great time seeing the cars and helping out a few fellow Hot Rodders in need. The video below tells the story of the day the Power Tour came to town! Click to see our Power Tour Photo Gallery! The V8 Speed & Resto Shop and V8TV Crew will be on-hand at the 2015 Street Machine Nationals in DuQuoin, IL, June 26-28. This is a very fun event, celebrating Pro Street heritage and horsepower all weekend long. This year, the show expands its activites with an autocross in addition to the burnout contest and other special activities like the Legends Of Pro Street display. Click the Read More link for the complete schedule of events at DuQuion 2015! We caught up with renowned blues rock guitar master Kenny Wayne Shepherd at the YearOne display at the 2010 Hot Rod Power Tour stop in DuQuoin, IL. We chatted about Tour, Kenny's 408-powered 1970 Plymouth Duster, and what it's like to Rock in concert and roll on the Tour at the same time! 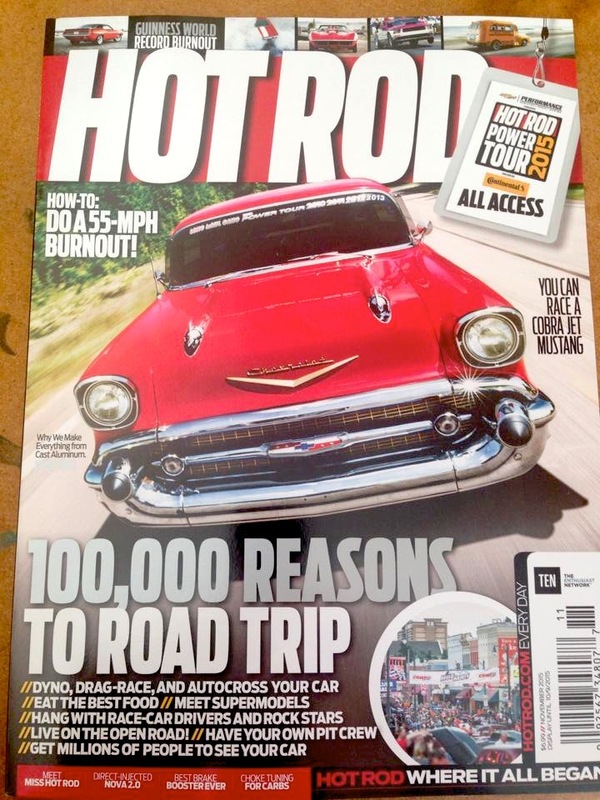 The 2015 Hot Rod Magazine Power Tour will be coming down Illinois Route 3, the very same street that the V8 Speed & Resto Shop and V8TV call home. 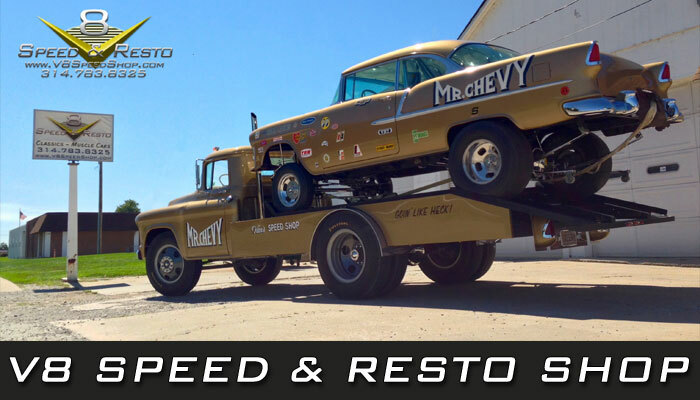 The V8 Speed & restoration Shop is a full-service restoration and performance center with lifts, tools, welders, and highly-capable technicians ready to help anyone who needs it. Replacement parts are also available locally. The Midwest Musclecar Challenge is quickly becoming the most popular Pro-Touring event in the Midwest. What is this you might ask, it is a rare opportunity to see the industries top Pro-Touring built cars battle it out. This event is open to any domestic model year vehicles. The event will be held May 29th & 30th 2015. The event will be held at Putnam Raceway Park on Friday May 29th and at Terre Haute Airport on Saturday May 30th. This is a three segment event which includes the Hot Lap Challenge, autocross challenge and a cruise. The focus of this event is education. Participants will have access to instructors, course tips and ride along opportunities. We will help educate the participants about safety, your vehicle, handling tips and promise you will walk away from this event with much value for this growing industry. We will have timed sessions and a competition segment, but we want participants to get the most out of the event, have fun and be able to handle their vehicle in a race environment, understand safety and become a better driver on a course. We do not operate this event for profit; this is an event that gives back. Proceeds go to the Cancer Research Center of Lawrence Country. Our focus is to provide a safe and educational event for the Pro-Touring car enthusiast. We will have two celebrities, Al Unser Jr, multiple Indy League winner including a two time Indianapolis 500 winner & Robbie Unser former Indy Racing League driver and eight time winner of the Pikes Peaks International Hillclimb. Al & Robbie will be there to support the event, offering participants driving tips & guidance along with offering participants photo opportunities & autographs. The high horsepower fun will begin on Friday with Forgeline Hot Lap Challenge. Putnam Road course is one of the best in the country; the 1.78 mile road course has 10 tire screeching turns laid out on beautiful landscape in Putnam, Indiana. The track is located 35 miles west of Indianapolis, Indiana. A full day on the road course assures everyone plenty of track time and there will be instruction available for novices or those that want to improve their existing skills. 10/10ths Motorsport will be providing instructors for the Putnam Park Road course. Saturday the action will continue at the Terre Haute, IN Airport, with the Orange Cone Racing Autocross Challenge, with more than 5 acres of great pavement we are able to setup a one of a kind autocross that will be fun and challenging at the same time. We will be inviting members of the media to cover the event and participant in the action. The event has been sold out for participants since early February. But spectators are welcome and it’s free for all ages. (Free will donations are accepted) This is a rare opportunity to see cars from the East Coast to the West Coast, including cars from Canada as well. The cars range from a 1969 Camaro to a 2014 Stingray Corvette. These are the same cars that fans have seen on MAV TV, Optima Ultimate Street Cars, as well as several other national television shows and magazines. Vinny Allegretta's 1968 Pro-Touring style Camaro is a double-threat street / autocross car that utilizes some trick new parts to make everything work. Riding on a killer suspension system from Air Ride Technologies, the big block Chevy powered Camaro features big horsepower, an aggressive look, and a driving experience enhanced by a Twist Machine Shrifter paddle shifter. The best part of the car is that Vinny drives the hell out of it! Stacy Tucker is not only the 2007 Goodguys Woman Of The Year, she's a driving force behind Detroit Speed and Engineering, as well as a force behind the wheel. In this video, Stacy takes some time to school our own Kelle Oeste on the ins and outs of the Autocross. They tear up the parking lot at the Run Through The Hills event in the Detroit Speed "Test Car" - a killer 1969 Camaro set up to road race as well as it handles the streets. We spied this 1966 Corvette at the Run Through The Hills event last fall, and although it's not 100% completed, the owner was having tons of fun with it. Powered by an LT1 350 Corvette fuel injected engine and sitting on a newer C4 Corvette chassis, this car really burns up the drag strip and the autocross. In fact, it won in both events! Bob Chiluk's 1969 Camaro is built with Pro-Touring style, but it's subtle approach is what makes it stand out. The Fathom Green exterior makes the white stripes "pop," and that's where you start to see the details creeping in. Bob nailed the stance with the Intro Speed Star wheels, and the built small block has plenty of power to shred 'em. Shot at the 2007 Run Through The Hills event. The crew at G-Force Design Concepts just finished DEMON - a pro-touring style 1971 Dodge Demon built to thrive on the roads. Featuring a complete Air Ride suspension and a crate Mopar Hemi engine, the DEMON makes tons of power and is able to keep it under control. This video was shot at the recent Pro-Touring.com / MuscleRides.com Run Through The Hills IV event in Pigeon Forge, TN. DEMON snaked through the cones with ease, leaving everyone possessed by its performance. Andrew Borodin's 1970 Pontiac GTO has been around the block a few times, and keeps picking up new tricks at every turn. This time, Andrew ditched the previous mill - a Big Block Chevy - in exchange for a new-tech, lightweight, all aluminum GM L92 6.2 liter V8. The GTO rolls on a trick - but simple - suspension that sticks in the turns and features Corvette brakes. After adding a few goodies like Corvette accessories and intake manifold, he jammed in an LS7 camshaft and now the Goat runs 12's, goes around corners like crazy, and still racks up 23 MPG. Watch the video to learn how.. and to see it on the drag strip and the autocross! Herbert Lumpp's clean 1966 Chevrolet El Camino is set up with a well thought-out selection of suspension pieces and drivetrain parts to make it a competent road-course and street machine. Powered by a big block Chevy engine, it's backed by a 5-speed manual TKO 600 trans spinning a Currie rear axle and rides on a complete Global West suspension system. We shot the car going around the cones and down the drag strip at the recent Run Through The Hills IV event in Pigeon Forge, TN. Check out the suspension camera! If you're going to sell parts and claim they perform, you better be able to demonstrate their performance in public. That's the philosophy of the crew at Air Ride Technologies... they build cars showcasing their parts, then thrash the daylights out of them in public autocross events around the country. We spent some time with Bret Voelkel to learn about the latest Air Ride cars - SuperNova and Velocity.